The Sabres rookie camp concluded on Friday with a 6-1 blowout win for Team White. I'm a little late to the plate, but here's what I saw as the rooks skated in their third scrimmage in three days before making room for the veterans. Team Blue opened scoring early in the first when Luke Adam busted down the right side and slid a a 2-1 pass to Tyler Ennis. The shifty Ennis took a clean lane to net and used a quick deke before lifting the puck over Jhonas Enroth's shoulder. It was all White from there. A few shifts after the Blue tally, a blind centering feed from the corner made its way to the stick of Mark Pysyk. The 2010 first rounder calmly settled the puck and drilled a rising slapper past former Princeton Tiger Zane Kalemba to tie the score. Marcus Foligno would give White the 2-1 lead when he tapped a Marc Mancari shot from the corner over the line. Mancari's throw made it through a group of two or three bodies and sat on the line for a second before getting knocked in. This is pretty much how Foligno will score the majority of his professional goals - using his big body to clean up rebounds and loose pucks near the paint. Jacob Lagace would give White a 3-1 lead into the first intermission when he crashed the net and the momentum of the play carried the puck through Kalemba and over the line. Lagace would score a more conventional "Jacob Lagace goal" on power play early in the second period when he drifted into the high slot and one-timed a Marcus Foligno pass top shelf to put White ahead 4-1. Travis Turnbull fattened the White bottom line before the end of two, finishing a nice pass at the top of the crease from a breaking Dennis McCauley to make it 5-1. The third period would come with a spike in hitting and the teams trading power plays. Cedrick Henley rocked the boards with a good finish behind the opposing net. Turnbull smoked Lagace along the near boards. Maxime Legault missed a golden opportunity to light up a retreating dman as the lead forward on a smart chip-and-charge. The game's only near dust-up came when Felix Schutz and Nathan Gerbe exchanged pleasantries near the top of the frame. After the two collided on the near boards, the tenacious Gerbe immediately went looking for the German forward, offering a few pokes from behind that brought the pair nose-to-nose. Words were exchanged before Gerbe dropped his gloves and helmet, ran his hands through his hair, and put on the foil. Schutz, fresh off an unsuccessful AHL bout last season, opted to conserve energy and skate away from the fearless, 5'6 forward. The two closed their argument with an expletive-laced exchange that continued from the benches. Corey Tropp would score the only goal of the period when fellow rookie Nick Crawford took the puck on the left boards, wound up in a shooting motion, but instead ripped a pass directly to his tape for the easy tip-in. The old Jason Woolley play. Final score: White 6, Blue 1. Fourth-year man Marc-Andre Gragnani left the ice late in the first period and did not return after suffering a knee/leg injury as the result of a blocked shot. John Vogl of The Buffalo News reported that Gragnani left the arena before the end of the scrimmage, with more details becoming available on Saturday. Gragnani still comes across very casual at even strength. Once he opted to pass across the front of his net, and another time he made what I felt was a lazy pass from the point to a cutting forward. He looks comfortable on the power play, but even then I was looking for more motion and a better sense of urgency. Kevin Sundher, who stood out for his ability get the transition game to the neutral zone and advance the puck deep, was most impressive for his faceoff abilities. I stopped charting them after a string of consecutive wins demonstrated his knack for controlling the dot. Sundher is strong and smart and looks to be a key element to the Sabres' center position moving forward. As expected, fellow 2010 third-rounder Matt MacKenzie held his own with the elevated level of competition. He limited his margin for error via low-risk decisions with Dennis Persson and later Corey Fienhage, and also rotated into PP time with T.J. Brennan after Gragnani left the game. Like Pysyk, MacKenzie plays the percentages and will be a better player with added strength. He had a clean look from the point in the second period, but didn't get all of it causing me to note "MacKenzie needs more mcmustard". Good news for Portland forwards: Paul Byron is healthy and firing. I love his lightning-bolt style. I love his creativity. I would love him to wear some kevlar body armor because his high-flying offensive game and fearlessness would be a huge attribute for a full AHL season. Mike Weber was another player who may have been saving his best for when the vets report. He played his usual stay-at-home style, and even exercised his trademark 'step-up and drill a guy' when meeting an oncoming rush. I've seen him do this with success in juniors and the "A", and I've seen him go for the same hit in the NHL and take himself out of the play. In the third period, he circled in his end with the puck and coughed it up due to the forechecking pressure of Zack Kassian. Kassian continued his hard-driving ways Friday, coming back to his end with more determination and making plays along the boards to pin defensemen. A few times he found little holes that allowed him to go to the net, but his offense was generally limited. He's saying the right things off the ice and it looks like he's doing the right things on it. I still think there's an opportunity for him to make some noise in training camp, but one more season of maturity and junior success still presents the best long-term plan for the bruiser. Fienhage is a physical monster who has already shown improvement over his summer camp performance. I love his athleticism and awareness, and you really notice his size and thickness in the corners where (at this level) he can box two guys out at once. There was one instance Friday where he stiff-armed an attacker and quickly shoveled the puck with his free hand to his defensive partner. Like this summer, there are other times when I'd prefer he was quicker in his breakout decisions but for now we're content watching his game take shape. He does a good job making sure guys don't get back door when he's facing the play. Luke Adam at center? Yes, please. I've previously rattled on about the likelihood of Adam engaging the pro ranks as a left wing, but he likes to play the pivot and can succeed there if remains committed to his own-zone responsibilities. We'll see what Kevin Dineen thinks in a couple of weeks, but Adam is going to swoop into space and collect his share of goals regardless of where he lines up. Corey Tropp on a line with Adam? Yes, please. It didn't happen Friday, but the former Michigan State Spartan continued to bring it on the forecheck and complete his assignments. Couple in his finishing ability, and Tropp has all the makings of forming a deadly combo with Adam at some point. Jacob Lagace on a line with Byron and Derek Whitmore? Yes, please. The puck seems to find him, and he does well when he gets it. I made a comment to Vogl that Lagace and Ennis have the same instincts and shiftiness with their hands, but like Byron, Ennis just does everything faster. The current SabresProspects poll results are suggesting a runaway in rookie farm production, but pairing Lagace with a slick distributor like Byron will give the ex-Sag/Screaming Eagle every opportunity to narrow the perceived gap. Adam scored .478 goals per game in the QMJHL, while Lagace marked at a .471 clip. Showing no signs of a stressed finger, Owen Sound's Steven Shipley dug his blades into the ice a few times as he went to the net. Doing that with regularity upon return to juniors should translate to serious offensive numbers. Brennan continues to ascend the blueline pecking order in Portland with his up-ice thinking and steadiness in his zone. Brennan, who lined up with Gragnani on Blue's top power-play unit, is expected to be a player whose athleticism will carry to the next stage of development. Paired with Brennan, Alex Biega executed well with the puck and looked to make some hits on the boards. Crawford will add a safe, two-way skill-set to the Pirate blueline in year one of his three-year deal. Drew Schiestel continued to display positive elements while paired with Weber. All the tools are in hand, but this season is all about consistency. There was one particular instance where he returned to the bench shaking his head because he failed to make a crisp pass in the opposing end, but for now it's prudent to isolate his play in his own zone to determine how much he's developed. We'll reserve judgment until the start of the AHL season. I was yapping away and saw a great sliding play to break up a 2-1 rush. 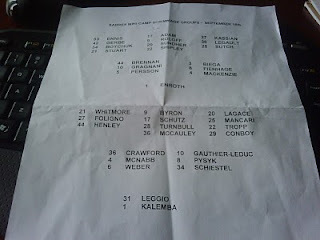 I had it as 34 Blue - Riley Boychuk. At one point, Lagace and Schutz nearly connected on a nice 2-1 PK break. The play referenced earlier where Kassian put heat on the retreating Weber came on the tail end of a White PP. That's about it. The first batch of rooks (Jerome Gauthier-Leduc, Gregg Sutch, Henley, Shipley, et.al) will be returned to their junior clubs in the next few days as the Sabres key on some positional battles en route to shaping their opening night roster. Among the projected CHLers, I still think Brayden NcNabb and Kassian are two possibilities for pre-season time with Pysyk perhaps holding a slight chance at getting a taste before heading back west. Personally, I'd like to see how Fienhage and MacKenzie adjust to the quicker pace, but that's asking for too much seeing how the Sabres will have about 20 blueline bodies in town for main camp. How they decide to divide time before dispatching them all for their 2010-11 assignments remains to be seen. Byron was on fire Thursday with 2 goals and an assist. This is a big year for him in Portland and my gut tells me he is going to make the NHL at some point. Sounds like Lagace was much more noticable Friday. I hope they keep Adam at centre as he gives this team a dynamic up the middle they have been lacking. Kassian has a much higher hockey I.Q. than he is giving credit for. The mix on the blueline is very impressive. Crawford and Biega look like natural PP QBs down the road and I would probably group M. Mackenzie in there too. Guys like Brennan, Leduc, McNabb can bring the bomb on the PP as well. Pysyk and Schiestal are dynamic skaters who will be all around defenders. I think moving to the WHL will be very positive for Fienhage and he could develop into a physical, stay at home #6 dman down the road. Sundher has a nice package of skills and some decent size. A good year out west and i bet he is a beast at rookie camp next year. I'm excited with this group of rookies. Throw in the college kids and it is a nice mix. Like any team's prospect pool, you would like another dynamic scorer, but overall the future looks bright. nice write up Kris. Biega was w/ Leopold this morning and in limited viewing they seemed to have good chemistry. I wonder if this guy isnt as far away as we think. It really seems like there are several Dmen that could be legit NHL talents in the next 2/3 seasons. I wonder how this is all going to shake out. Glad to hear Byron is back on track. He was only in the practice group this morning. It'd be nice to see him have a strong camp and get some exposure to the big club coaching staff. As with the rookie camp Schiestal is having a strong start to the regular camp. One of the best D so far. hopefully Pysyk mcnabb and kassian make the canadian squad. if anything mcnabb and kassian. with kassians size you gotta figure his strategy will evolve. some power forwards rely on hitting more then others. i know during the legion of doom days leclair would often be throwing big body checks as well. it allowed lindros to get open in the slot. perhaps kassian doesn't have top 6 talent. however the intimidation factor goes way up when the other linemate is just as imposing. perhaps Foligno ? It would be awesome to see 2/3 more? Sabres draft picks make the world juniors. I am definitely amped for that and cant wait to get to some of those games. Also cant wait to see what kind of coverage Sabres Prospects has of the event.